Immortalized in Silver, the Best Pilot in the Galaxy! Some people just know how to fly. While he isn’t Han Solo’s son (unfortunately, a distinction that belongs to the evil Kylo Ren), Poe Dameron is definitely a spiritual descendent of Han’s effortless and gritty heroism. A commander in the Resistance’s Starfighter Corps and the fleet’s most decorated pilot, he’s been described by many (including the actor himself) as the one you want on your team. Along with his trusty droid BB-8, he begins Star Wars™: The Force Awakens looking for a piece of a map that pinpoints the location of the elusive Luke Skywalker. However, through a series of events, he joins an adventure that gathers several improbable heroes to destroy the First Order’s Starkiller Base -- and the story is far from over! 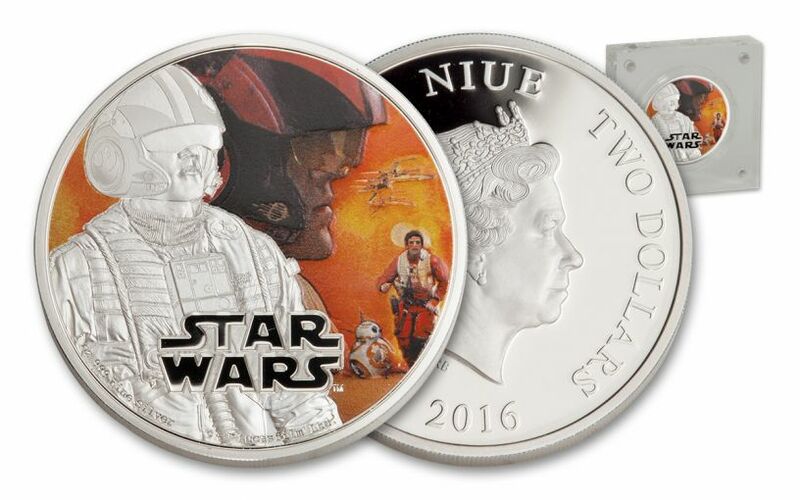 To commemorate this character’s introduction to the Star Wars canon, the New Zealand Mint and Lucasfilm Ltd. are including Poe Dameron as the sixth character in their official Star Wars: The Force Awakens series. 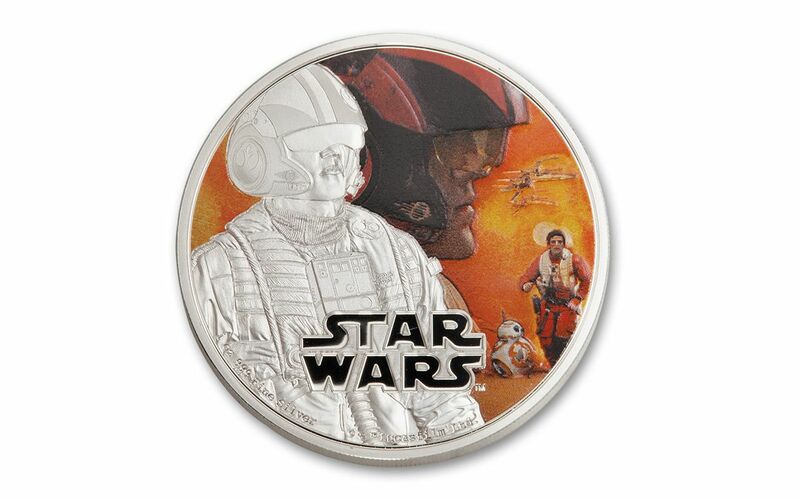 From one ounce of 99.9% pure silver, this Proof is intricately engraved with Poe Dameron, wearing a flight suit along with his steely gaze. The etching is set against a full-color background that combines Poe’s profile, his ship and his determined gait with BB-8 at his side. Your Proof gleams with a mirrored finish -- the result of repeated mint strikes, carefully selected planchets and polished dies. 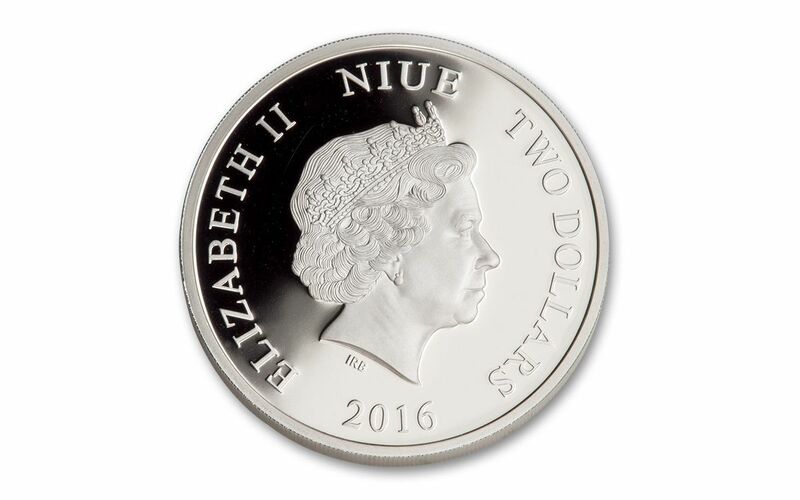 In addition, your coin’s status as legal tender for the Pacific island country of Niue shows itself on the reverse with an image of Her Majesty, Queen Elizabeth II along with the coin’s denomination of $2 Niue. 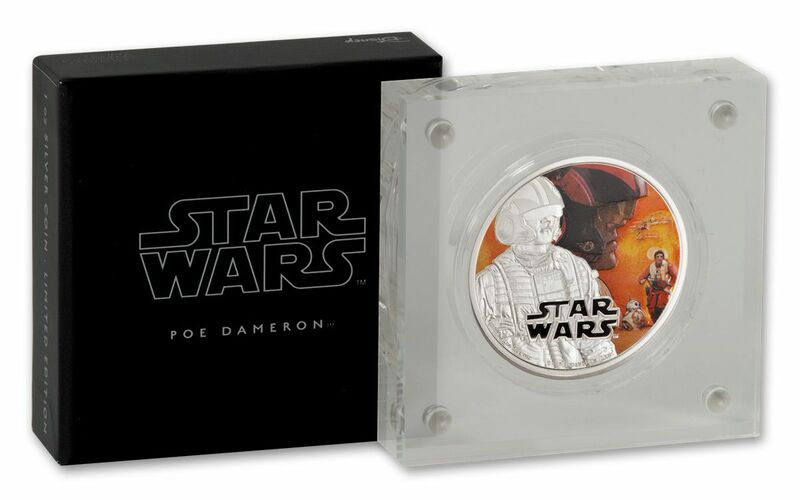 Your Poe Dameron Proof comes already encased in a futuristic acrylic display case along with Star Wars-themed packaging. This new hero is already a fan favorite, which means that our supply of Proofs received from the New Zealand Mint might not be enough to meet collector demand. Extend the collection you already have or secure this unique collectable for your favorite character -- wait too long, and you could be left behind!